IC Markets has taken steps to reduce the leverage on select instruments ahead of the June 23 vote. Photo: Bloomberg, Voters think that Britain is indeed "stronger in Europe"
The word of the day and heading into the weekend is still Brexit, and while the likelihood of a schism between the UK and the EU has become less likely this week, foreign exchange brokers are taking no chances, altering leverages on select instruments ahead of the June 23 vote. IC Markets joins a growing list of brokers in adjusting its leverages amidst a cautionary approach to potentially heightened levels volatility next week. Like many other of its counterparts, IC Markets has targeted GBP-denominated currency pairs and the UK100 index as the key focus of its leverage reduction. As such, the broker has implemented a leverage of 1:50 (2%) for GBP pairs and the UK100 index, by far the index with the largest exposure into the UK capital market. By extension, EUR currency pairs and the euro indices are also slated for an adjustment – both sets of instruments will see their leverage reduced to 1:100 (1%). The timetable for IC Markets’ leverage and margin changes is largely commensurate with the rest of the industry, beginning on June 21 and lasting until the vote and any potential flux in volatility has ran its course. Finance Magnates has compiled a list of existing brokers that have already opted to change their leverage ahead of the Brexit vote. The list can be read below in its entirety. 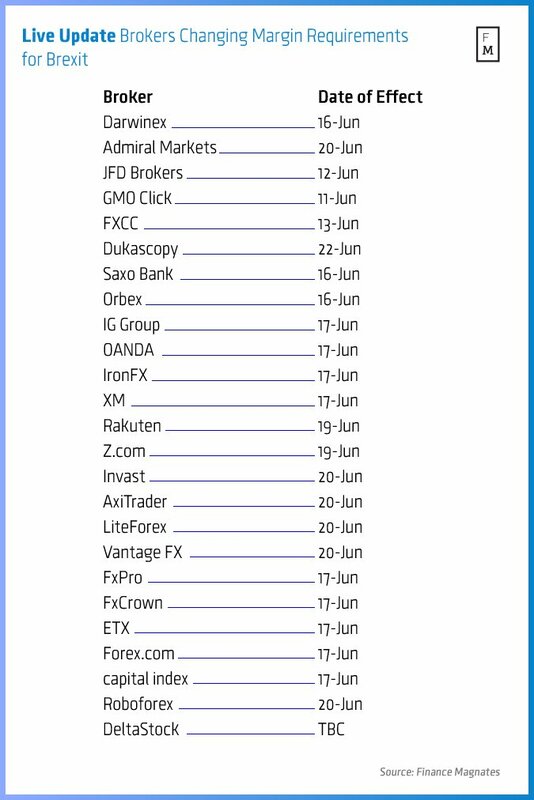 I don’t see Global Prime Au or RubixFx broker listed there. Yes, there will be some volatility…..but it is only a referendum!!!!! come on guys.